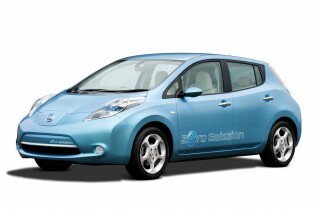 The first private French customers have received keys to their own Nissan Leaf EVs, a month ahead of schedule. Mr. and Mrs. Gerbaud took delivery of their white Leaf in Aix-en-Provence on August 2nd. By delivering the vehicle earlier than planned, Nissan has demonstrated the company’s effort to recover from the natural disaster of March 11th in Japan and the readiness of Nissan’s EV dealer network in France. Carine Gerbaud will primarily use her new Nissan EV for daily commuting to her workplace, which is well within the Leaf’s electric driving range. For the Gerbauds, the decision to buy an electric vehicle wasn’t just about preserving the environment, but also about saving money since the Leaf has low running costs. “We’ve been spending 400€ per month at the petrol station. From now, we should only pay 60€ per month in electricity. The extra cost of the vehicle will be recovered in one year after which the monthly fuel saving can be used as a contribution towards the monthly finance repayments,” explains Mr. Gerbaud.